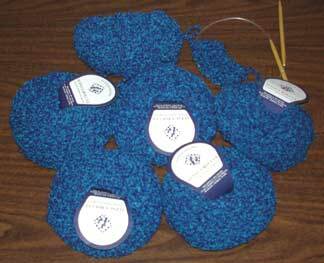 What's your favorite sock yarn? Okay, I was going to do this as a poll, but I know there are a *bunch* of different sock yarns out there. 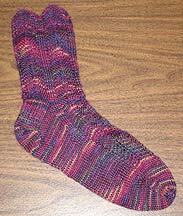 So go ahead, leave a comment and tell me what your favorite sock yarn is and why. I'll tally up the votes and report back next week! Here's the project that I've been working on. Broadripple Socks knit with Bearfoot in the Wild Raspberry colorway. And in Halloween news. . . my Mom started a new tradition -- a pumpkin carving contest! All the sisters (there are four of us!) and brother-in-laws and their offspring got together monday night for homemade pizza and pumpkin gut flinging. Fun! Happy Halloween! 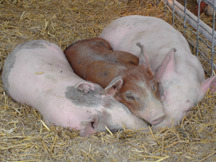 I can't figure out how to get plain old picture links from Amazon anymore. You have to have this "buy from Amazon" stuff on the bottom. Hmph. Anyway. . . I recently read Persepolis 2 by Marjane Satrapi. 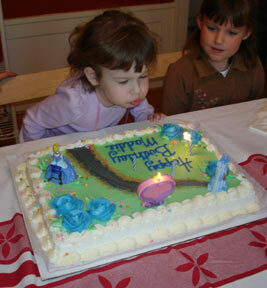 I read her first book, Persepolis, and loved it. The second book was just as good, if not better. I couldn't put it down and read it an in afternoon. The second book is focused more on her struggle to grow up while being torn between two cultures. I highly recommend both books. And now I'm reading The Namesake by Jhumpa Lahiri. Another excellent book. Let's put it this way, I've been up past midnight the last two nights because I couldn't put it down. Lahiri won a Pulitzer Prize, and a bunch of other awards, for her collection of short fiction, Interpreter of Maladies. In knitting news, I was well behaved and finished the other front of the wrap jacket yesterday. 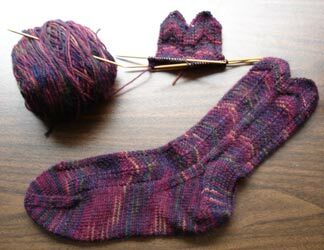 I even worked on another WIP -- my Broadripple socks. I'm still itching to start something new though. Time to go dig through the stash -- fun! I felt that the blog was a little boring, so I got busy (ie wasted a ton of time) with a redesign. Not sure how long I will want to look at the girlie pink, but I like it today. In knitting news, I'm getting restless to start something new. (Do you see a theme here?) But I am going to try to continue on with the wrap Jacket. With a couple of hours of steady knitting I should have the other front finished. The Kureyon in my yarn closet is calling me though. . . It was a busy weekend, but I managed to get the left front of the wrap jacket finished and I made a good start on the right front. 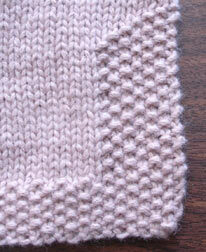 I love how this cabled yarn makes seed stitch look so beautiful, so I thought I would include a close up. Some of this knitting was done in the seating area at Nordstrom (big department store in the area), believe it or not. Theresa and I got together for a fun day of shopping and coffee drinking. You know it's a good shopping day when you get to hang out with a good friend and you also find a pair of jeans that you like! While the primary focus of last week was preparing for Maddie's 4th birthday party, I did manage to start a new project. That's the back of the Wrap Jacket that I mentioned a few posts back. 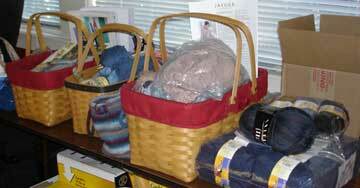 It's knit with Jaeger Chamonix -- YUM! Since it's knit on US 10 1/2's, it's flying off the needles. 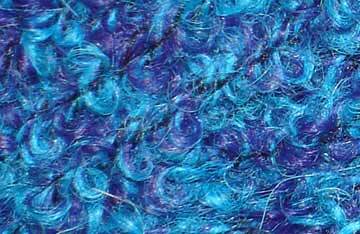 And who wouldn't want to take a little time to knit with this lucious angora/extra fine merino blend. I can't stop petting it! I have been knitting! In fact, I finished the first project on my list. 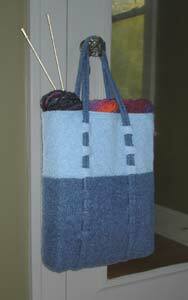 It's my new Black Sheep Bags design called the Heidi Tote. I still have to finish the pattern and get it to the printer's, so it may be a couple weeks before I'm ready to ship to yarn shops. And someone asked what colors I used. The light blue is 7815 and the dark is 9332. 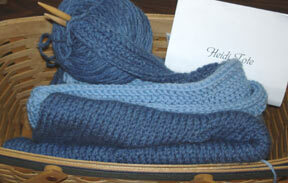 And next on the list was the Keepsake shawl, so I have been knitting away on it! I'm into the 8th color. I'll post more pictures once I get a little further. This is Plymouth's Alpaca Boucle which I purchased at Perfect Touch Yarns. It's 90% alpaca / 10% nylon and it's super cheap! $5 per ball. I got 6 to make a sweater for Maddie. It knits up on US 10 1/2's so it should be a quick knit. I'm going to design the pattern myself. I completely forgot about this pattern and have been searching for something to make with this yarn. Yesterday when looking through a pile of patterns, I spotted it. 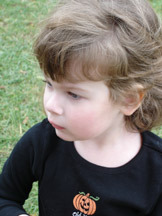 This may have been one of those free Rowan patterns you get when you subscribe. Now, the only problem is that I'm not all that fond of the color of this yarn. Dare I dye the finished garment? Suggestions? 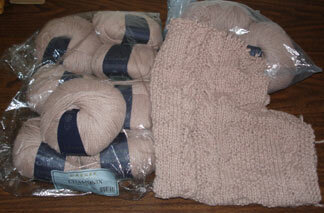 Here's the yarn for Besseggen, which I am going to make for Pete. 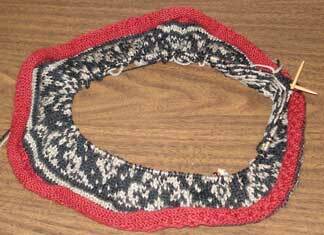 I'm going to try to wait until I finish Ingeborg to cast on for this sweater, but I may not have the patience! 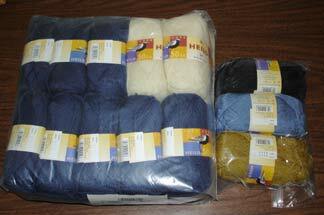 And finally, here is the sock yarn that Pete chose last time we were at ThreadBear. After I finish up my 2 pairs of socks-in-progress I'll start these. Well, that's the plan. I'm sure it will change and morph before I'm even halfway through the autumn, but at least I feel organized today. It's time to tell the truth about the mess that is my knitting WIP's. Look at that mess! My WIP photo gallery was so out of date that I completely deleted it. So, I'm coming clean, abandoning some projects that may never be finished and coming up with a list of projects in the works, or on my "to do" list. First up is the Heidi Tote. This is a new design for Black Sheep Bags and I'm *so* close to being finished. It's my top priority right now. Project #2 is my Koigu Keepsake Shawl. 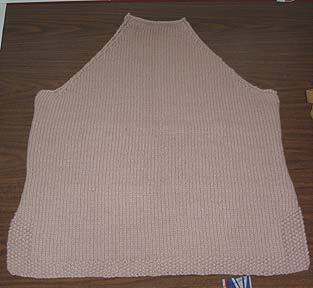 I'm putting this next on my list because I want to finish it before it gets too chilly. And I really love knitting it. After all the work I've done on it, I'm not bored with it at all. Socks. I've got two sets in progress and would like to finish them up so I can start a pair for Pete. Oh Ingeborg. You are at the bottom of my WIP list right now, but at least there isn't much ahead of you. I want to finish Ingeborg before the holidays. Can I do it? Tune in tomorrow for the stash dive! Pete found this wonderful interview with Marjane Satrapi, which I though I would share since it is directly related to my last post. Now on my night stand: Candyfreak by Steve Almond.